Celestron FirstScope « Adafruit Industries – Makers, hackers, artists, designers and engineers! Cool Tools – Celestron FirstScope. 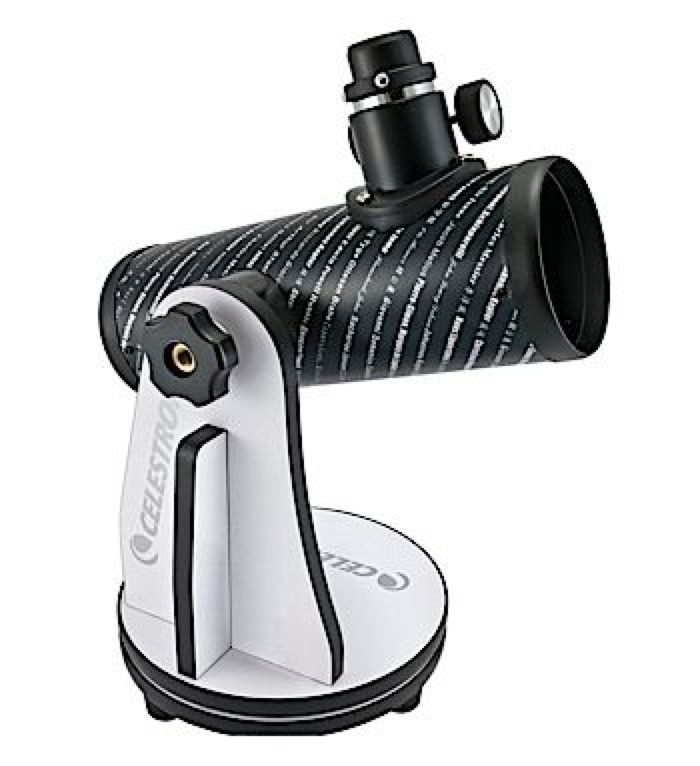 The Celestron FirstScope is the best pick for an absolute beginner level telescope. Most entry-level scopes are crap, and most useable scopes start at $300. Since the FirstScope costs only $42, you might be tempted to dismiss it as more useless junk. But I’ve been using the FirstScope, and it is sweet. It needs a sturdy chair or table to perch on, but otherwise is easy to handle. It is compact for storage; it can fit onto a shelf — and it is the perfect size for a small kid. Pretty durable, too. With its 3-inch mirror you can see moons of Jupiter, ring of Saturn, and lunar craters. (I missed that recent comet.) Many other buyers mention that if you substitute decent eyepieces (from another scope) it improves the view tremendously. With one of those you can view a few bright galaxies. It will also focus as close as 30 feet away; we’ve used it as a terrestrial telephoto lens to scan the wildlife on the mountain behind our house. The little firstscope is good but the Orion ‘Fun Scope’ is a good challenger with a finder and two fairly reasonable eyepieces too! On sale now, June 2013, for $50. I have used them both and I do not have any relationship with Orion except as a customer.